They say mouth is made for communication, and nothing is more articulate than a kiss; it beat my imagination what’s going through the dolphin’s mind, what the fish is trying to communicate and how the dog interpret it, may also your guess too. But clearly it has a lot of love for the dog by giving the pooch a kiss before literally jumping for joy. Whoever say animal don’t have feeling will surely re-evaluate his or her believed after watching this amazing video. Enjoy this great video; a magic moment caught between a dolphin and dog having amazing lips kiss! Doglopedix They say mouth is made for communication, and nothing is more articulate than a kiss; it beat my imagination what’s going through the dolphin’s mind, what the fish is trying to communicate and how the dog interpret it, may also your guess too. But clearly it has a lot of love for the dog by giving the pooch a kiss before literally jumping for joy. Whoever say animal don’t have feeling will surely re-evaluate his or her believed after watching this amazing video. 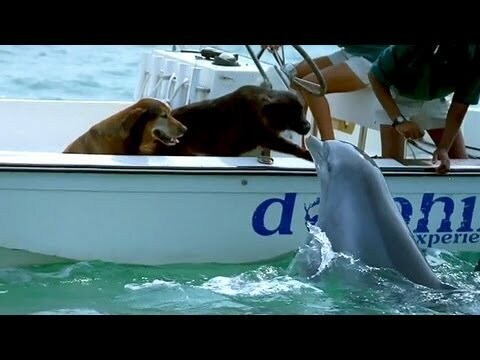 Enjoy this great video; a magic moment caught between a dolphin and dog having amazing lips kiss!